For close to 40 years our Rotary Club has been offering fresh Florida Fruit from November to March. 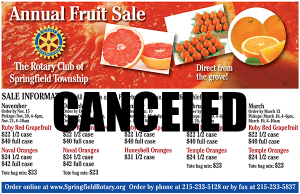 Unfortunately, the remainder of this year’s Fruit Sale, both the February and March sales are canceled, as the supplier could NOT get us enough fresh, properly ripened fruit. We apologize for any inconvenience. We hope to see you in the Fall 2016 for our next sale. To find out more information and to order our fruit CLICK HERE. 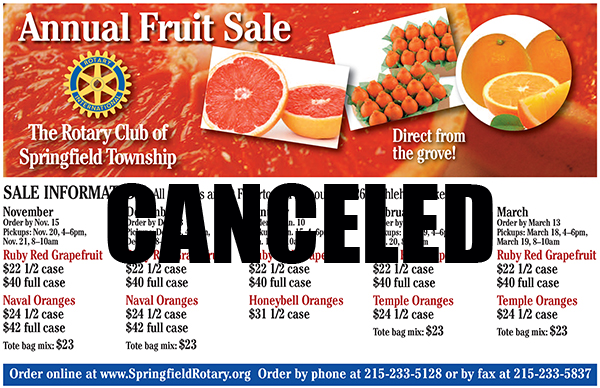 We’re always looking for Sponsors for our Fruit Sale. More Sponsor Information. The Rotary Club of Springfield Township is once again to provide the community with citrus delivered fresh, directly from Florida. This annual event is anticipated by our many patrons and is a major fund-raiser for the club so it can continue its service locally, regionally and internationally, wherever there is a need. 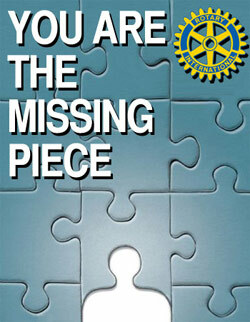 To be added to our mailing list please email our Rotary club. To order or for more information each month please visit our Fruit Order Page.